REDDING, Calif. - Simpson University’s School of Education honored 34 new teachers during a medallion ceremony inside the Heritage Student Life Center on May 22. The ceremony, designed to specially recognize those who have completed student teaching, takes place twice a year following Simpson University’s traditional commencement ceremonies. About 200 friends, family members and master teachers of the graduates attended the event, which included a dessert, speeches by winners of Outstanding Student Teacher awards, a Dean’s Cup presentation, and other special recognitions, including honoring retirees Dr. Neita Novo, associate professor of education, and Merlina Phillips, director of student teaching. The graduates included two students from Korea, where the School of Education offered on-site and distance-education courses for several years. Audience members came from Shasta, Tehama, Trinity, Siskiyou, Modoc, Butte, Placer, and San Joaquin counties, as well as Southern California. Outstanding Student Teacher awards went to Kayla Benton and Ashley Fuller (single subject) and Marissa Fuller and Amy Lee (multiple subjects). Each woman shared thoughts on why they want to be teachers – Marissa’s were read aloud as she is in Australia completing her student teaching. 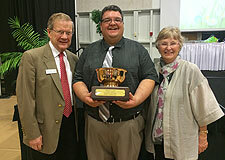 The Dean’s Cup went to Michael Barnett, who stepped up his student teaching role to fill in for his master teacher when she became ill and unable to finish the school year. “Michael was the comfort and support the students needed,” said Dr. Glee Brooks, dean of the School of Education. California Preliminary Teaching Credential candidates (for Multiple Subjects): Rebecca Borrelli, Kaitlin Campbell, Alanna Fornaciari, Kara Friedhaber, Marissa Fuller, Sarah Goodyear, Kimberly Heilmann, Trysha Kehoe, Shina Kue, Amy Lee, Cheryl Long, Megan Mitchelson, Shelby Ochoa, Adam Peterson, Marcus Price, Wesley Rea, Domenique Roberts, Jessica Turnbull, Kerrie Viss, Melissa Weirzbicki, and Jennifer West. California Preliminary Teaching Credential candidates (for Single Subject): Michael Barnett, Kayla Benton, Rebecca Choi, Stefanie Danna, Ashley Fuller, Ed Grant, Jiyoon Jeong, Don Lee, Brian Long, Erica Mitchell, Joel Quinn, Hannah Schmidt, and Gary Workman. 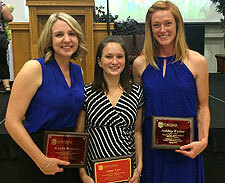 Top Left: Outstanding Student Teacher honorees, from left, Kayla Benton, Amy Lee, and Ashley Fuller (not pictured: Marissa Fuller). Bottom Right: Dean’s Cup recipient Michael Barnett stands with Dr. Richard Harris, associate dean, and Dr. Glee Brooks, dean of the School of Education.